The walls of Rick Harrison’s office in suburban Minneapolis are filled with colorful plans for subdivisions and town squares located in towns as close as River Falls, Wisconsin, and as far away as Saudi Arabia. The plans take into account topography and wetlands while offering far fewer streets, less impervious surfaces and generally more parkland than traditional suburbs. The blueprints have no straight-line streets. Harrison attempts to reduce energy use in his subdivisions while making them have much more curb appeal. Yet he’s not about placing solar panels on every rooftop, installing geothermal or adding a wind farm next to a community park. Harrison prefer to save energy through better design. The planning starts with taking into account the contours of the land and avoiding excavation as much as possible. That reduces the vast amount of energy many developments devote to moving dirt. Harrison, 61, is a Detroit native whose first job involved planning suburban communities in the late 1960s. He calls his approach “Prefurbia,” an invented word merging “suburbia” with a “preferred” standard he has invented (he’s written a book with the same name). He’s designed more than 800 developments in 46 states and 18 countries, including every Midwestern state. He recently spoke to Midwest Energy News. Midwest Energy News: You argue dense new urban developments — which advocates say reduce energy use — actually require more energy than your communities. How so? Harrison: New urbanism produces an enormous amount of infrastructure, so when you have all the short dimensions and homes in compressed states it means you’re filling up streets and alleys with pavement, versus green space. We do the opposite. We concentrate on the least amount of pavement and we can achieve similar densities with a whole lot less cost and environmental impact. The perception is new urbanism is an environmental solution but the reality is, it’s the most paved, most roof-topped per acre approach to density, which means it has the most runoff and is the most expensive. There are no affordable new urbanism developments. Even the Congress of New Urbanism boasts about its gentrified neighborhoods, but gentrified means expensive. We build communities that have the same connectivity as new urbanist ones at a lower cost. Our developments on average have 25 percent less infrastructure and attract mainly middle mass-market buyers. We have few gentrified neighborhoods. What things do you do differently? Let’s start with streets. We’ll usually get 25 percent less road by curving the road, often by reducing the width and by having fewer streets. A grid system creates a lot of intersections and side streets off main arteries. By having different setbacks for homes from the street — an approach we call “coving” — we can actually reduce street lengths. This site design by Rick Harrison shows streets and buildings conforming to existing topography. We avoid four-way intersections by developing three-way intersections to maintain flow until you get home. In small neighborhoods we can get away with no turns, in larger ones there will be up to two stops. Fewer stops means less gas used and carbon emitted. We use elongated roundabouts so people don’t have to stop. We split the road into one-way lane throughways so people turning right don’t have to stop and people turning left have to pause. Water is always an issue in new developments, isn’t it? Yes, there are many mandates involving storm water management. We try to use as much surface drainage as possible through meandering open spaces, prairie planting, permeable pavers and rain gardens. In some developments we focus rainwater so that it journeys to a central lake. Some of our developments don’t even have curbs — we depend on surface systems to handle as much rainwater as possible. You don’t seem to have renewable energy in your projects. Why? There’s not that much demand for them. Geothermal adds $20,000 to $50,000 and takes years to get a payoff. Solar is getting cheaper but it’s hard to have trees and solar. The best approach is to super-insulate homes — I have a 3,600 square foot home with great insulation that costs me $50 a month in winter to heat. You argue developments on rectilinear street grids use a lot of energy. Why? You’re always fighting topography, whether it’s a curved suburban grid or a straight urban grid. You have to move a lot of dirt to make it work. When they built Minneapolis they got rid of wetlands. When urbanists say “look at this density” — you could not do that today because of wetlands. You couldn’t build that density today. You developed coving in 1993 and used it in hundreds of developments. How does it work? Coving lets us vary the setbacks of homes from streets based on location. Residents often get a large front yard that encourages mingling with neighbors. We’re trying to get away from the cookie-cutter approach of all homes being the exact same distance to the street. Coving also encourages walkways, porches, tapered long driveways and designs that allow more residents to have views of natural features. We can still design fairly dense neighborhoods using coving. How do trails fit into your designs? We lay out the potential recreation trails first. We plan them so they arrive at something — a park, a playground, a commercial area that may be located just on the exterior of a development. The trails are wide enough to allow emergency vehicles to use them to get to an emergency faster, in some cases, than they would using a street. What are the major challenges in planning suburbs today? There is no education on suburban planning anywhere. There are no college courses. Everyone and their brother is a planner — architects, surveyors, anyone. 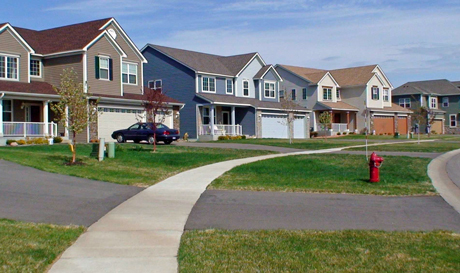 People design subdivisions by reading the ordinances. Consultants strive for most units on a site to satisfy clients and don’t consider connectivity, function, views, value or saving infrastructure. There’s a tremendous amount of waste and no one is teaching how to recognize waste. St. Paul journalist Frank Jossi writes about politics, business, energy and the environment. His website is www.jossi.biz. A Prince William County project offers hope that Virginia solar developers can navigate land-use politics in the region.